"The line has been crossed. Actors play murderers, robbers and gossips, but the gay lifestyle is always glorified. The other sins always seem to be punished or redeemed, but TV shows never show the downside to homosexuality: the loneliness, shame, broken families and marriages, diseases. The shame does not come from "society" but from God. So, even if the gays get everyone in the world to accept their behavior as 'normal,' there will still be shame, because it goes against God. Unless sin numbs their soul and their heart turns to stone, they will hear the still, small voice of God saying, 'I have a better way.' I was asked to do a lesbian kiss in a show once, and I said no. But, I'm guilty of being part of a few movies that may have been a bad influence on young people. I'm very sorry to anyone I led away from God." 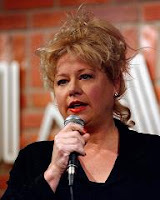 - Victoria Jackson, in yet another rambling, deranged, Scripture-laden piece for World Net Daily.